This worldwide unique and high-quality skull will leave no unanswered questions in the study of skull anatomy. One half is of a bone-like material, but the other is transparent. This makes it possible to follow the structures from inside to outside, giving the skull a special didactic value. On the right, transparent skull half, the paranasal sinuses can be easily located, even from the outside, as they are are marked in different colors - maxillary sinus (yellow), ethmoidal sinuses (orange), frontal sinus (green), and sphenoidal sinus (purple). The cranial sinuses and the neck and facial arteries are also shown in color: sinuses of dura mater (blue), common carotid arteries, external and internal carotid artery and the branches of the meningeal artery (red). 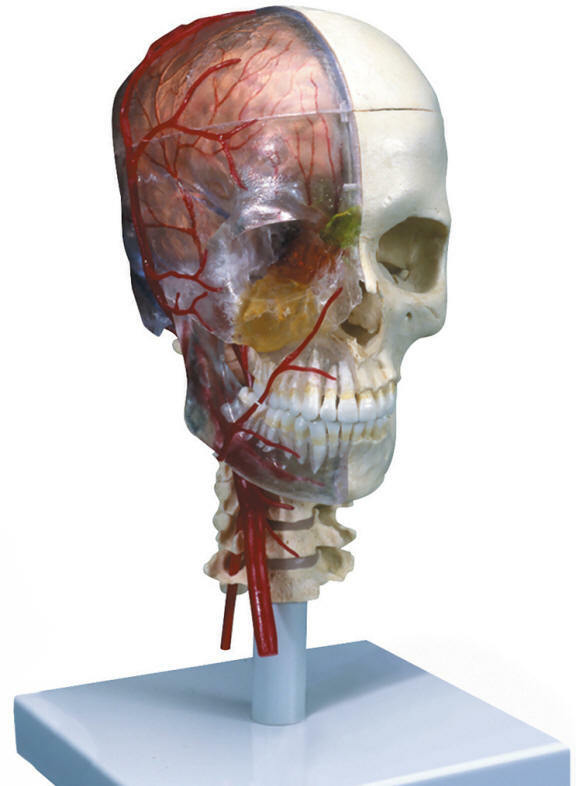 One brain half, which is also visible through the skullcap, visualizes the brain in position and the course of the sinuses. The peridontal pockets and dental roots can be studied through the transparent jaw. The lower jaw is mounted flexibly to demonstrate the masticatory movements. The skull is mounted on the cervical spine and can be dissembled into half and the skull cap, the left half of the skull, the nasal septum, the complete mandible and the brain half.